How do you Choose the Best Tower Heater? If you are looking to invest in a powerful heater that doesn’t encroach on your space, why not consider a tower heater? Tower heaters can heat rooms quickly and effectively and tend to be energy efficient. Choosing the model you want can be a little tricky, and depends on your needs and lifestyle. Here is a guide that delves into the options available and how to select the ideal tower heater for you, with some pointers on the most effective models available at the moment. Tower heaters are tall and thin, which makes them a great space-saving option when heating a home. There are three main types of tower heaters: ceramic, oscillating, and without blades. Ceramic tower heaters send electricity through the ceramic plates, giving the benefits of consistent heat, without the fire hazard or burn risk. Oscillating tower heaters spin around, so you get full coverage of the room as the heater directly blows heat out. Tower heaters without blades are aesthetically beautiful, not presenting health or safety issues, especially for children and pets. Ceramic tower heaters usually work using convection heat. Electricity heats up the ceramic plates, and a fan is used to blow the heat around the room. It creates a circular motion of hot air, as it displaces cool air in the room. However, there are a few designs of ceramic heaters that work using radiant heat. Electricity heats the ceramic plates, and the heat is left to radiate from these ceramic components, without being blown around the room by a fan. Convection heaters tend to be faster at heating the room. Ceramic heaters tend to be less hot to touch. Oil-filled tower heaters are generally all radiant heaters. The columns of the tower heater are filled with oil. There is an electrically powered heating element which heats the oil inside the heater. Oil has quite good thermal mass, so it holds the heat for a long time. The heat radiates upward from the oil, through the metal heater through conduction. They are a little slower to work with than ceramic heaters, however, they tend to keep the room consistently warm for a longer period of time. They take a while to cool down so they will stay hot even after the power is shut off. They are very hot to touch though so they can be a hazard to children and pets. When choosing a tower heater, there are a few important things to consider related to your own lifestyle. Firstly, you want to think about the size of the room that you want to heat. In general, you need 10 watts for every foot square of space in the room. The wrong size heater will either be too powerful or unnecessarily expensive and energy-wasting or will not have enough power to heat the room. With this in mind, electric heaters can sometimes be expensive, so compare the initial cost with the cost of running in terms of wattage, to work out which heater will be most effective in the size room you want for the lowest overall cost. Secondly, in terms of energy efficiency, unfortunately, space heaters do not yet have a standardized efficiency rating system. However, by choosing the right power capacity for your room, you will find the heater to be more efficient. Additionally, look for heaters with a thermostat to keep a consistent temperature, and with programmable timers, and eco or energy saving modes. You may also want to think about safety. If you have small children or pets, you may want to consider a heater that is cool-to-touch. Equally, look for heaters with shut-off mechanisms in case of overheat. Some tower heaters come with a tip-over mechanism that shuts it off if it falls over, a great feature to reduce fire risk around children and pets. If you are moving your heater from room to room for zonal heating, you may want to consider its portability. Tower heaters can come with wheels for more easy movement. Also, consider the weight and whether it has a handle or not. Another thing you may want to look at is the ease of operation. Many heaters now come with a variety of programmable settings to make it easier to automate the heating experience. However, some can be very confusing. Consider what you will be using it for and how much control you want over your heat. Some heaters can be loud. Noisy heaters generally have fans inside. If you are using the heater in the bedroom, a loud fan can be disturbing, so take this into account. While often overlooked, there is also the aesthetic aspect. You are adding a feature to your home, so you want it to be consistent with your current decor. Try to find a heater that fits in with your home image, so it doesn’t interrupt the flow of the ambiance. 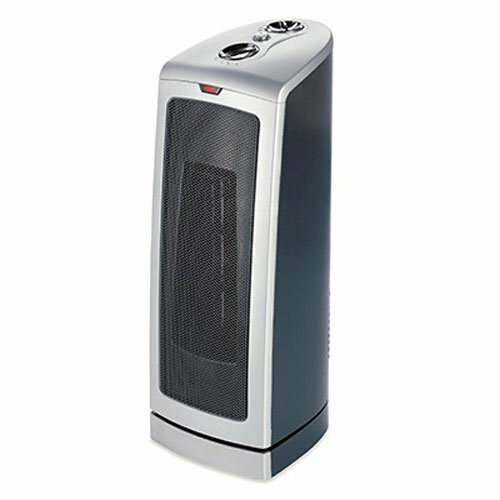 When choosing a tower heater, you can get lost in the wide range available on the market. Remember to consider your own personal preferences as a starting point for short-listing the heaters you want. Here are a few of the best models out there to help you understand what you are looking for. To be used on either the floor or a table, this model has three settings or high, low, or fan only. It has 1500 watts of power and can oscillate, while also featuring overheat protection. Despite having a fan, it is extremely quiet. It is versatile and can be used on the floor or on a table. It has an electronic thermostat to keep the room at a consistent temperature. It can oscillate or it can be kept static allowing for direct heat or convection heat. The fan can work on its own meaning this model can be used in hot weather as well as cold. The cord and plug seem to heat up when are set to the maximum temperature. Heat doesn’t always seem to travel well out of the heater if you don't set it to oscillate. It is a small heater that is surprisingly powerful. While it is less impressive when is not oscillating, the moving settings allow it to heat the room well. A remote-controlled whole room heater, this device is an oil-filled radiant heater with 1500 watts of power and three temperature settings. It has a low surface temperature and is on wheels for better portability. It is easy to program, and the remote is very convenient. The wheels make this heater easy to move from room to room. It heats the room well even on eco mode, a setting that also helps to lower the cost of bills. The low surface temperature makes it safer for children and pets than other devices using the same technology. The beeps on the remote and it has limited angles. This heater works very well and is safer than most for children and pets. It is convenient to use and to move around the house, but it is a little noisy. This model has a self-regulating ceramic heating element and 1500 watts of power. It has a programmable thermostat and an 8-hour timer as well as being able to oscillate. It has automatic overheat protection and a handle for easy portability. The overheat protection is a good safety bonus to help prevent a fire risk. While being a good size, it is quite lightweight and has a top handle, making it easy to move around. The oscillation and the self-regulating ceramic elements spread heat quickly and effectively around the room. Easy-to-operate, this model has a programmable thermostat and 8-hour timer which enables you to set it to your most comfortable mode. The cord gets hot which is a bit of a fire risk. The handle is a little slippery which makes it easy-to-drop. This can damage the ceramic. It is an easy-to-use heater with a good variety of functionalities to suit your needs. The temperature stays consistent, and it has added safety features. However, be careful when moving it as it is easy-to-drop it and can damage the ceramic. This ceramic heater oscillates for better convection. It has a programmable thermostat and two heat settings, with 1500 watts of power. It features a remote control and digital display. The heater is very quiet even when it is oscillating. It heats rooms very effectively and quickly despite being very small sized. The remote control is very convenient and fits neatly into the handle socket. The thermostat is not the most accurate. The thermostat only works when set to the highest setting, which uses a lot of electricity. It is a convenient-to-use heater which gives out a lot of heat while not taking up much room. However, the thermostat is not very accurate and can only be used if you are using the heater on full power. With 2 constant heat settings and a timer, this oscillating heater has a dust filter, and tip-over and overheat protection. It is a ceramic heater that uses 1500 watts of power. It has wide oscillation which helps to heat a whole room evenly. It is very quick to heat up a room and surprisingly powerful despite not being very large. It has a timer that has 4-time settings, making it convenient for use and energy efficient. This heater has exceptional safety functions, making it a great choice for people with children and pets. The fan is noisy, and so are the beeps when the buttons are pushed. The tip-over function is a little oversensitive and cuts off heat with even the slightest bump. Surprisingly powerful for such a small heater, it oscillates with a wide berth, heating the room very quickly. It has great safety features, but they are a little oversensitive. It is also not a good idea to sleep with this fan as it is a little noisy. Tower fans are great space saving options for any home, as they are tall, and have thin aesthetics, which means they don’t need much room. Look for something that can be moved around easily for zonal heating and consider the safety features, especially when you have small children. With this in mind, first, think about the technology and then delve into the many features, from controllable thermostats to oscillation and remote control units.